With more and more people making pets a part of their families, it should come as no surprise that the pet product industry is booming. According to the American Pet Product Manufacturers Association (APPMA), American pet owners have been spending more on their pets each year. In 2017, the pet product industry grossed $69.5 billion in revenue. And that figure is expected to continue to rise. So if you've been thinking of getting into the pet product industry, now may be a good time. By following a few steps, you can become a part of this booming business sector by starting your own pet apparel design business. Before looking at the pet apparel industry, it's important to understand pet ownership. According to the National Pet Owners Survey of 2017-2018, 68% of American households owned at least one pet. Of those families, 60.2 million owned a dog, while 47.1 million owned cats. That number is expected to increase steadily each year. Additionally, owner spending on pets shows no sign of abating. With the increasing numbers of animals kept as pets and the growing popularity of pet clothing and accessories, the pet apparel industry should continue to show steadily increasing sales. The pet apparel industry seems to have boomed since the 2000s. Before that, you may have been lucky to see a dog in a sweater. Now, there are just as many options for pets as there are for humans. Pet apparel has expanded beyond the dog sweater. Go to any pet store and you'll find coats, dresses, bows, specialized collars and ties. Not to mention holiday wear. You can get Halloween costumes for your dogs and cats, and even Christmas-wear. And most people are willing to spend just as much on clothing for their pets as they would for their children. So it's important to consider what you can offer to the industry. It's not enough to say you can make a great coat or a sweater. That's all been done. Ask yourself what would set you and your product apart that people would want to buy it. Maybe you're tailoring something for bigger dogs or for specific breeds of cats. Perhaps you're considering "ethic" wear for animals, a market that hasn't necessarily been touched. The bottom line is make sure you can bring something to the market that no one else is producing, otherwise you won't succeed. Now that you've decided what you're going to market, you' re going to want to know how to execute it. Anyone who wants to get into design of any kind should know some of the basics — whether that's for humans or animals. So the aspiring pet apparel designer should know how to sketch designs, measure and cut patterns, select appropriate types and quantities of fabrics, use a sewing machine, and hand stitch or do other finishing work. If you don't have substantial sewing experience, try teaming up with an experienced seamstress or take classes to learn the fundamentals. Prior experience in an animal-related field is a plus when starting a pet apparel line. And, retail or marketing experience — especially in a position related to pet product sales — will come in handy in order to sell your product to outlets such as pet boutiques and pet supply stores. As with any new business, you'll want to consider establishing yourself as a sole proprietorship, limited liability company or another type of entity. It is best to consult with your attorney or accountant to determine what type of business is appropriate for your specific situation. This is also where you'll want to start brainstorming about your business name. Once you've established the kind of company to set up, you'll need to register your business name. It's important to come up with a unique name and logo for your pet apparel business — something catchy that people will remember. Items of pet clothing may include coats, sweaters, rain jackets, hoodies, wedding apparel, dresses, denim items, T-shirts, bow-ties, ribbons, pajamas and Halloween costumes. Designers frequently detail each piece by hand and use high-quality fabrics to ensure a superior product. Some designers offer high fashion couture lines that look like they just walked off the runway, or accept custom orders for specialty items, including monogramming. Another possibility is to create high-quality or custom-made pet carriers owners use to transport their small dogs. Your business name and logo should be featured prominently on all advertising, product tags, clothing labels and websites. That's one of the best ways to market yourself. 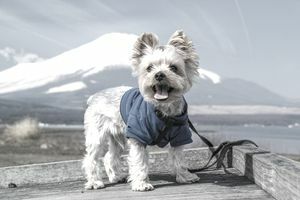 It is important to emphasize the unique, high-quality nature of the pet clothing products you design. Consumers are willing to pay more for top-quality items for their pets — as evidenced by the booming gourmet pet food and pet toy industries — provided they see a value attached. You'll also want to take some great photos of your products. When taking photos of the product line, be sure to take photos of both live models and on dog mannequins. Also be sure to feature items for a variety of large and small dogs, unless, for instance, you choose to limit your business to only one kind of breed, such as toy breeds. And don't discount the power of videos. People want to see how the products wear on their pets, so what better way to show them than to take a quick video. It doesn't have to be overly produced — you can even shoot and edit it on your smartphone or laptop with a basic editing software. Social media is also a very important avenue to consider when you're advertising your pet business. You can create a Facebook, Twitter and/or Instagram page, post the photos and videos of your products and attract followers and new consumers. Another thing to consider is linking your page to other pet-related pages to boost your audience. Another thing you should consider — especially when you're starting out — is to get a great promotion. Some businesses offer incentives for new customers like free shipping, discounts for first orders or freebies. Once you've established the relationship, ask them for referrals or recommendations. There's no better way to advertise your business than through word of mouth. Pet apparel can be sold through a designer’s website or a brick-and-mortar location. If a designer doesn't want their own shop, it is possible to find a space for items in locations such as general interest gift shops. This will require some sales savvy — especially if you're trying to partner up with a bigger pet store chain. In this case, you may want to approach your local pet store. They may be more open to letting you sell your wares in a portion of their store. Other ways to promote your pet apparel line are magazine or newspaper ads, local TV spots, and direct mail email campaigns. Events like dog shows and pet industry expos are also excellent places to set up a booth to show off your product line to consumers and industry professionals. Pricing decisions should be made by taking into consideration the cost of materials and labor, as well as evaluating the prices set by your competition. It is smart to shop around your area as well as online to see what other designers are charging for similar items of equal quality.